This sequel to the fabulous Gone Baby Gone was fun, but not up to its more famous predecessor. Baby Amanda is grown up and now a smart and precocious teen with an agenda all her own. Our favorite detective pair Patrick and Angie have gotten past the crisis of conscience that split them up 12 years earlier over Amanda’s earlier fate, and are now married with a daughter of their own, a more cautious approach to life, and a step away from bankruptcy. When Amanda –and a friend– goes missing, a stricken Patrick gives up a potential dream job to find them and bring them home. In no time, he and Angie find themselves tangling with the deadly Russian mob and its psychotic crime boss. It seems Amanda stole something that belongs to him. Moonlight Mile has much of the funny and loving repartee between Patrick and Angie that its predecessor story had, and is both delightfully paced and truly funny at times, while giving us some chills and thrills along the way. There is a lot of violence in the latter part of the book (the death by train was especially gruesome! ), Amanda is just a little too sophisticated to be believable, and the denouement is just a little too neatly packaged for my taste. Gone Baby Gone has a jagged climax which gets under your skin and leaves you squirming and sleepless long after the last page is turned. Moonlight Mile, even with the same characters and city, just doesn’t cut it. 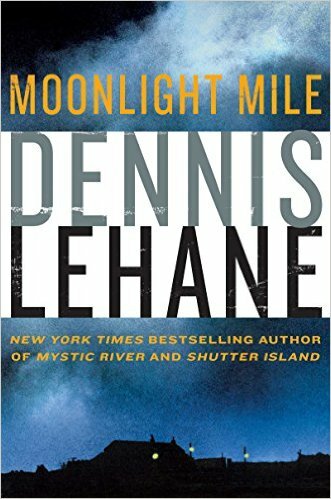 The good guys don’t have quite the grittiness they had in earlier Lehane novels, and the bad guys are mostly cartoonish, to the point that I felt like I was reading Carl Hiassen–most disconcerting in a Lehane book. When the most appealing character in the novel turns out to be a mobster out to replace his boss, you know it’s time to finish it and forget it. 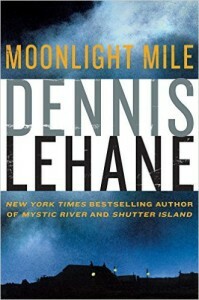 But Lehane is still Lehane, and I look forward to better stuff to come. Share the post "A fun but mostly disappointing sequel to Gone Baby Gone"
Agree on Moonlight Mile being weak. It’s my least favorite of the mostly amazing Kenzie/Gennaro series. Have you read the others? There was one between GBG and Moonlight Mile called “Prayers for Rain” that brought Angie and Patrick back together chasing a serial killer. The absolutely brutal “Darkness Take My Hand” is my favorite. I second the idea of reading the Kenzie/Gennaro books that came before Gone Baby Gone. Moonlight Mile felt a little bit “We’re getting the band back together” for me. I think the fire has gone out of those characters for Lehane, even if we’re loath to see them go.